Prime Wardrobe is Amazon's latest thrust into fashion and could be another big blow to department stores like Macy's, which are struggling with weak sales. 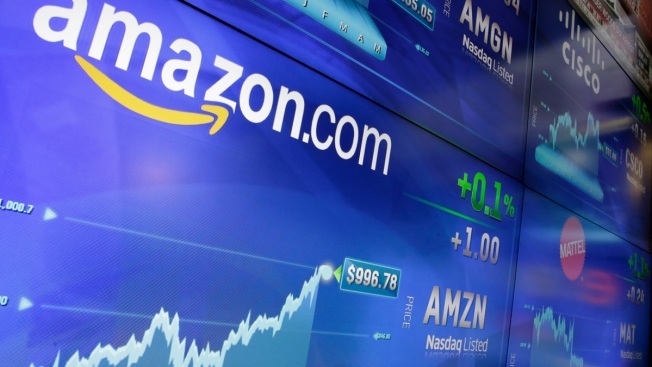 FILE PHOTO - In this Tuesday, May 30, 2017, file photo, the Amazon logo is displayed at the Nasdaq MarketSite, in New York's Times Square. Amazon announced Tuesday, June 20, 2017, that it’s testing a new service for its Prime members that lets customers try on the latest styles before they buy at no upfront charge, take seven days to decide and only pay for what they keep. Amazon said Tuesday that more than a million pieces of clothing and accessories are eligible and include brands like Calvin Klein, Hugo Boss, Theory and Levi's, labels that are big names at department stores. Shoppers receive discounts depending on how much they keep. Prime Wardrobe is Amazon's latest thrust into fashion and could be another big blow to department stores like Macy's, which are struggling with weak sales. It's also a potential concern for Walmart, which has been snapping up online clothing brands including ModCloth and Bonobos as it tries to snare millennials. But Amazon's new service is a threat to newer, online businesses as well; clothing subscription services like Stitch Fix, which charge a styling fee of $20. Amazon has made a concerted push to expand into fashion through private labels like Lark & Ro. But with Prime Wardrobe, it's bidding for more loyalty from already devoted members of Prime. Amazon is poised to surpass Macy's this year as the largest U.S. clothing seller, according to Cowen & Co. analysts. The industry observer expects Amazon's share of the U.S. clothing market will increase from 6.6 percent last year, to 16.2 percent by 2021.